Candy question of the day: why is the trade newspaper ConfectioneryNews.com publishing an article about FIBER? “Novel Fiber May Blunt Blood Sugar Spikes” (8 Oct 2010) describes recently published research results on PGX, a “novel fiber supplement.” This research did not involve candy. Researchers spiked breakfast cereal with this soluble fiber and studied the blood sugar response to eating. Subjects who ate the fiber had more even blood sugar response. As sugar goes, so goes candy. When artificial sweeteners moved from the nutritional fringes to the dietary mainstream in the 1950s, the sugar producers and the candy industry realized quickly that their fates were intertwined. New medical research finding now confirm that you can have your sweets and your waistline too. … Sugar before meals raises your blood sugar level and reduces your appetite. … And don’t forget that candy is also a wonderful source of quick energy. … So don’t be misled into thinking candy is necessarily fattening. Candy can actually be effective in helping you to reduce. My favorite part of this little pamphlet is the new twist on an old candy marketing strategy. Back in the ‘teens, the National Confectioners Association came up with a punchy candy slogan that captured the aspirations of candy makers to move their product from the category of luxury and treat to the category of everyday purchase: Candy is Good Food. Eat Some Everyday. In the Sugar Industries insert, we get a new twist on the theme: Candy is a delicious food, eat some every day to help your diet work. The shift from the old slogan to the new diet variation suggests a new role for candy. The old slogan posed candy as another kind of food, just as good as meat and fruit. All foods are for energy, and candy gives you energy too. The new slogan says candy will “help your diet work”: that is, candy will help you eat less of all the other kinds of food that are making you fat. Food is fattening, and candy is the solution. Candy is food, and better than food. Jump forward 60 years, and you are in CVS, choosing between the SlimFast bar, the Full Bar, and the ThinkThin bar. Eat more candy, lose more weight. For the backstory on artificial sweeteners in 1954 and the impact on sugar marketing, see the first two posts below. You can read more about the “candy is good food” idea in the other posts listed below. Perhaps with the change in seasons you’ve taken up the task of packing lunchboxes once again. My guess is that most American lunchboxes don’t have candy bars in them. But I suspect many have other sorts of snack bars. Back in the 1940s, candy bar makers experimented with fortifying their product with vitamins: not just good, but good for you! The idea was that that candy’s energy (calories) just needed a little supplement to transform a treat into a meal. Sounds kooky, right? Well, muck-rakers up on the northern side of the border have been poking around in the nutrition labels of some of the biggest selling snack bars and guess what? In general, I wouldn’t consider granola bars to be healthy snacks. I’d consider them to be less-tasty chocolate bars…. I’d relegate granola bars into the treat category. America’s love affair with artificial sweeteners started in the 1950s when cyclamate became widely available. Reports linking the sweet chemical to cancer in lab rats were decades away. Artificial sweeteners promised the triumph of chemistry over the messy stuff of appetite and fatness. This all put actual sugar in a tricky spot. The marketing of artificial sweeteners didn’t mince words: sugar is fattening, fake sugar is not. Real sugar needed to find an angle. The sugar trade group, Sugar Information Inc., came up with an ingenious solution. They embraced the idea of reducing, but turned sugar’s calories from a deficit into an advantage in the battle against the bulge. In a massive advertising campaign launched in early 1954, Sugar Inc. told this story: Why do people get fat? They eat too much. Why do they eat too much? They are hungry. Why are they hungry? Their blood sugar has dropped. How to ward off that hunger that leads to overeating? Have a little sugar. The idea of blood sugar and appetite regulation was cutting edge nutritional science in 1954. 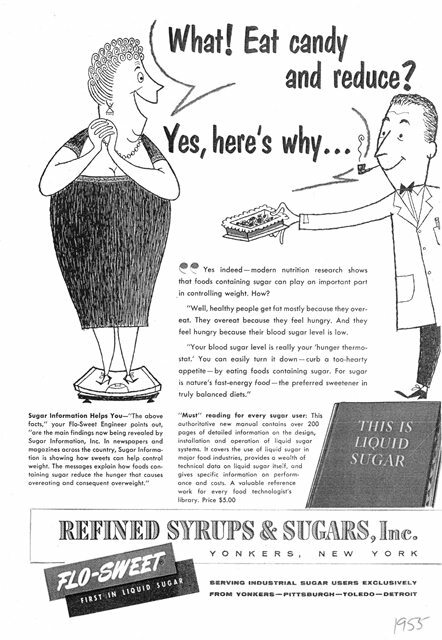 When Sugar Inc. started running these ads, the idea of appetite regulation and the relation to blood sugar was quite new, while the menace of caloric excess was widely recognized. In the early 1950s, Americans were gripped by a renewed fervor for reducing. Life insurance studies had suggested that as many as 5 million Americans were obese, and another 20 million overweight. According to these measures, weight problems afflicted nearly 1 in 5 of the total population. Public health officials began sounding the alarm in 1952, and by 1954, even mainstream publications like LIFE Magazine had joined in promoting the new view on America’s waistline: ‘The most serious health problem in the U.S. today is obesity.” Sound familiar? Today scientists are looking to high fructose corn syrup, estrogen disruptors, carbohydrate overload, and metabolic disorders to understand why, despite half a century of diet and exercise, despite lo-cal and lo-fat and lo-carb and hi-fiber, Americans keep getting fatter. Overeating just doesn’t explain the whole problem. But in the 1950s, the problem was firmly located in individual behavior. Fatness was explicitly associated with weakness, venality, sin. LIFE Magazine put it plainly: “The uncompromising truth is that obesity is caused by gluttony.” The solution? Eat less. Less food, to be sure. But in an age dominated by the precision of science, the real measure of “less” was not volume but calories. The food industry was quick to respond to the new market for reduced-calorie foods. Saccharine had been available since the late 1800s, prescribed by doctors for diabetic use but occasionally “abused” by dieters. Saccharine was of limited appeal, as it had a bitter and unpleasant aftertaste and was not easily adapted to cooking and canning processes. But a new synthetic sweetener, cylcamate, became available in 1950 under the trade name Sucaryl. Where saccharine had primarily been sold over the counter in pharmacies, cyclamate was quickly adopted by food processors, especially canned food and beverages. Saccharine sweetened drinks had been around since the 1920s but were not widespread or popular. But between 1950 and 1954, artificially sweetened drinks exploded. Well known brands like Lo-Cal and No-Cal were selling millions of cases, and there were something like 150 brands of cyclamate and saccharine sodas and drinks on the market. And “diet” foods including canned fruits and vegetables, skim milk, and lo-cal desserts moved out of the fringes of specialty “health” stores and into the aisles of mainstream grocery markets. In this ad you can see how “eat less” doesn’t mean eat less food. The low calorie dessert looks and (presumably) tastes the same as its full calorie counterpart. Sucaryl makes reducing seem almost magical: you can’t see or even notice what is different about the Sucaryl dessert. Just make the right choice of sweeteners, and your weight problem is solved. Sucaryl proclaimed itself “the new non-fattening sweetener that tastes just like sugar.” Which is to say, sugar is the fattening sweetener. Who was going to want to eat what was fattening? By implication, everyone needed to be counting calories to stave off the dread overweight, and so everyone should be using Sucaryl. It was a shot fired over the bow, make that the bowl, of sugar. And candy was directly in the line of fire. Saccharine and cyclamate made sweetness distinct from fattening. So America could have its sweet sodas and pies and canned peaches. But nobody knew how to make candy out of saccharine or cyclamate. Candy sweetness was sugar sweetness. What was a candy lover to do? The line seemed clear: candy — sugar — fattening — gluttony — sin.